This is perhaps my first ever acrylic painting. I have always feared painting, and because of that I have done very few paintings in my life. Pretty sure there are less acrylic paintings with my name on them than fingers on one hand. Every single type of paint has its challenges. Acrylic is horrible for me because it dries almost instantly. This means that you can't rework areas at all once they have dried, and this happens within minutes. Drawing and doodling scrappy junk are more my thing. 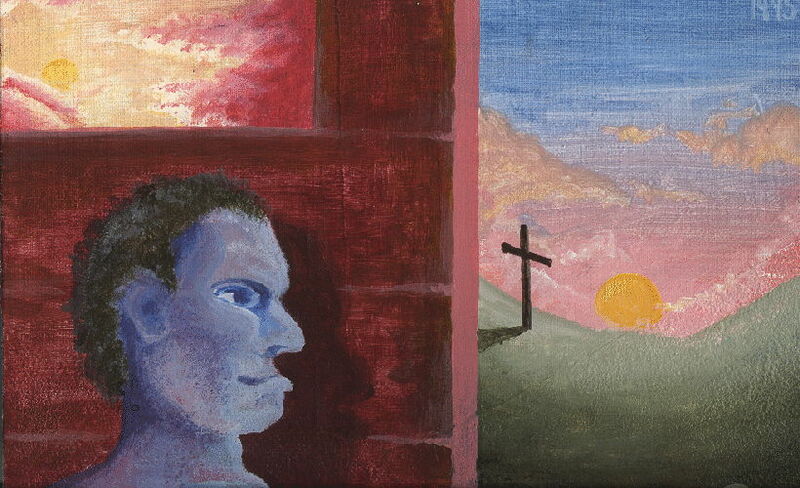 I don't remember if there was any meaning in my mind when I painted this in 1995. All my life I have suffered from mental and spiritual defeat. Perhaps the blue guy is like me. Even though there are beautiful sunsets surrounding, the dude's view is blocked by a brick wall. My life feels like that much of the time. Even so, I don't necessarily wish for something different. Cheery rainbow life confuses me because it seems fake. If everything went well and smoothly for me I would feel quite detached and robotic - even more than normal. Life is hard for me, but that's ok. After all these years I just sort of run with it and don't really expect any different. There isn't much anything useful for me to share with other people in this world except for understanding of how difficult it can be. Those talented and victorious people who succeed at everything they try are world's away from me, and I can't relate to them at all. Their stories seem as fictional as any video game, movie or comic book to me.